MEASURE S.B. : Santa Barbara artist Warren Schultheis didn’t really have a studio space for a big exhibit or the financial means to get one, but he had a vision: a show of works by contemporary artists responding to the question, “What will Santa Barbara be like in 50-100 years?” Inspired by the debate around Measure B, Schultheis began sharing his idea, and before long he had a show, and one that featured works by 20 established and emerging Santa Barbara artists. Among the pieces in SUPER SANTA BARBARA you’ll find digital prints, photographs, installations, and landscape drawings, each of which takes a fresh angle on the question of our community’s future. Thursday, November 5, is your last chance to catch the show, which is on display at 121 Santa Barbara Street, Room II, 5-10 p.m.
ART FOR A CAUSE: Aesthetic pleasure rubs shoulders with philanthropy this month at Gallery 113 (#8 La Arcada Court, 1114 State St.), where the Santa Barbara Art Association’s annual benefit exhibit is on display through November 27. The show includes works by more than 100 artists in a variety of media, and features the work of this year’s winners, Tony Askew and Patricia Chidlaw. A quarter of the proceeds from the sale of these works will go to Domestic Violence Solutions, which provides counseling and shelter to women and children in need across the county. Chidlaw’s evocative oil paintings capture America’s deserted urban landscapes with photorealistic detail and moody suspense, while Askew’s abstract monoprints are full of energy and movement. Don’t miss the reception, Thursday, November 5, 5-8 p.m.
Carlos Grano's "Art School" (2009). Over at East/West Gallery (714 Bond Ave.), owner Henri Bristol gives a last hurrah with THREE(s), his last show in this space. Bristol’s moving on to new endeavors, but first he’s celebrating three years in business with an exhibition of triptychs by artists whose work he’s shown in the past, and a few new ones as well. Among the works in this show are John Patrick Salisbury’s “OCE3,” a large-scale work in which three vertical panels depict a single image of bright white clouds scudding above an expanse of sea. Buyers can feel good knowing that 10 percent of the sales at this show go to benefit Santa Barbara Channelkeeper. THREE(s) opens today, Thursday, November 5, and runs through December 15, with a reception this Saturday, November 7, 6-9 p.m. After the conclusion of the show, the gallery will maintain an online presence. SHOOT FOR THE MOON: Ceramic artist Oscar Bucher is one of our town’s treasures, as are his pieces, which range from fine porcelain vases with glassy glazes to wildly misshapen, pockmarked vessels with strong personalities. A range of his newer work is now showing at Santa Barbara Arts (La Arcada Court, 1114 State St.) now through November 30. There you’ll find bowls like geodes with rough, lunar skins and gleaming interiors. In some of these pieces, the longtime City College instructor uses his signature “crater glaze,” the result of an experimental firing process. You’ll also find stoneware that stands on stumpy legs, raku wall hangings, and couple of ceremonial vessels with wide brims like half a pitted avocado and gold leaf glimmering from their concavities. 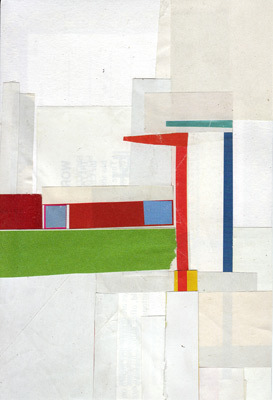 And over at Art Resources (512 E Haley St.), you’ll find not 25 or 50 but 100 collages by the prolific Carlos Grano, whose geometric creations have a simple, graphic appeal; think Mondrian with a pair of scissors and a glue stick. Collage! runs through December 19, with a reception this Saturday, November 7, from 5-8 p.m.